As part of the Oslo Knitting festival 4.-6. November I’ll be holding a workshop on darning! I’ll also be on the ready with a mending stand for anyone curious about mending or needing some friendly starter tips. You can view the festival programme and download the festival magazine here. Tickets are available from August 13th. Make sure you grab a spot! I’d love to meet some of you there in person! I’m equal parts excited, nervous, honoured, humbled and giggling about this! So much woolly goodness in one weekend, I can’t wait! At the workshop you’ll learn three different darning techniques which will give you the confidence and know-how to darn just about anything. Bring along a knitted garment that you would like to mend and I’ll help you get started and hold your hand as you set about darning it. The three darning techniques I’ll demonstrate are a classic “weave” darn, a knitted patch which is great for covering larger holes, and grafting (sometimes called Swiss darning) which is excellent for strengthening threadbare areas. I knit these mittens for one of my dearest friends five years ago (the year conveniently inscribed on the mitten front). Over the Summer I’ve held them in my hands again, now well-used, worn and with several holes. I offered to mend them in preparation for the coming darning workshop. Oddly, the act of mending became like an act of gratitude and respect. It was like I was honouring what I once took the time to make and finding a way to express an unarticulated gratitude to her for using them all this time. We go back a long way, the two of us. We would compete in having the longest giggling fits, read the same books and once, I remember, we sat in a tree in the school yard insistently debating who had the tallest Dad. At the time I knitted these mittens, though, we were done with all that. 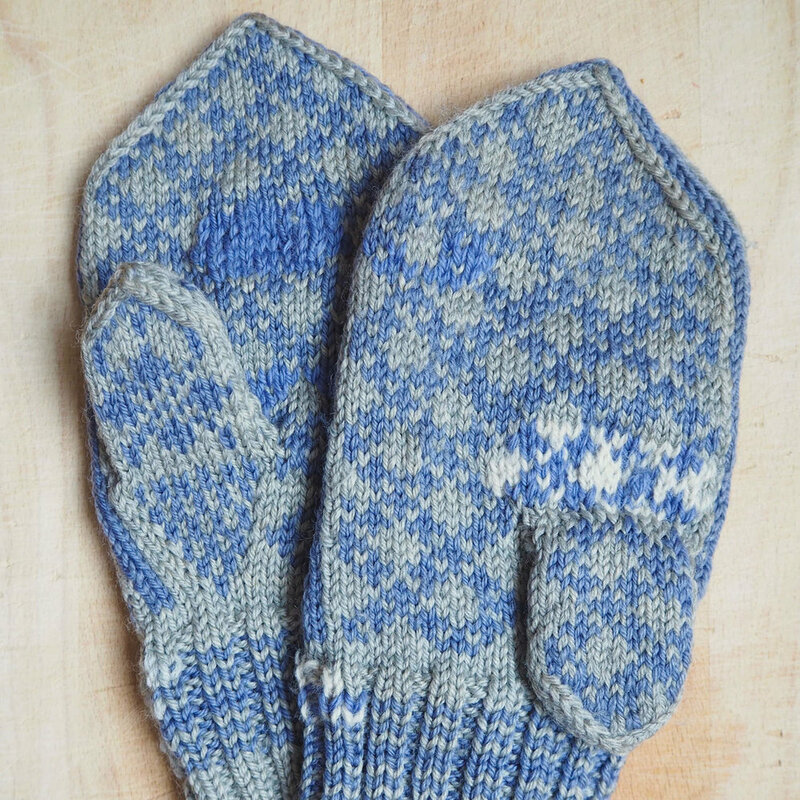 They may have been the first colour work mittens I ever knit. I remember counting stitches and rows and sketching out the pattern on graph paper in the dark of Wintery evenings. Memories kept trickling into my consciousness as I quietly stitched up one worn patch after another. I loved knitting them, and I found I loved mending them too. Mending is such an ordinary, everyday kind of thing: one of the many chores on the to-do list. And yet, there is something satisfying about making an object whole again. It is tangible and concrete, and actually very do-able once you know where to start. At the workshop I’ll show you how!